Two of my most favorite flavors are banana and chocolate. 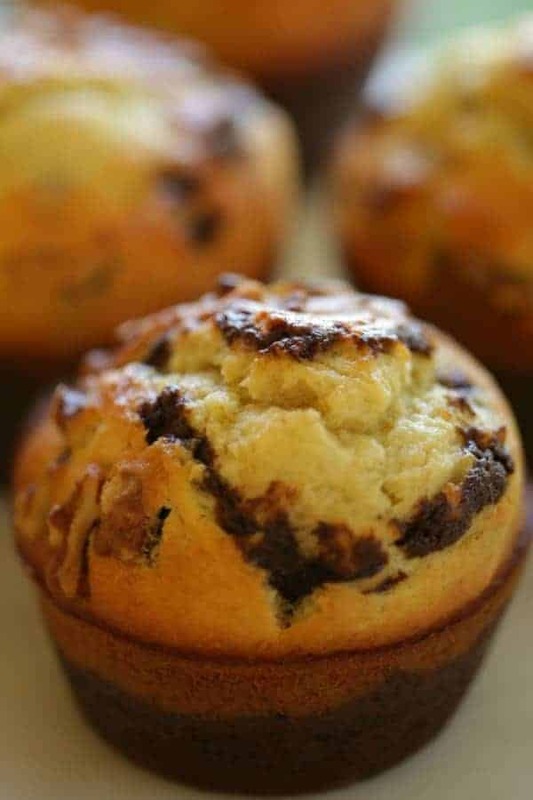 Put them together in a jumbo muffin and the flavor combination is sublime! 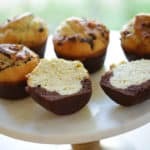 This is a great recipe when made in a Jumbo Muffin Tin since it allows enough room to fully enjoy both flavors. 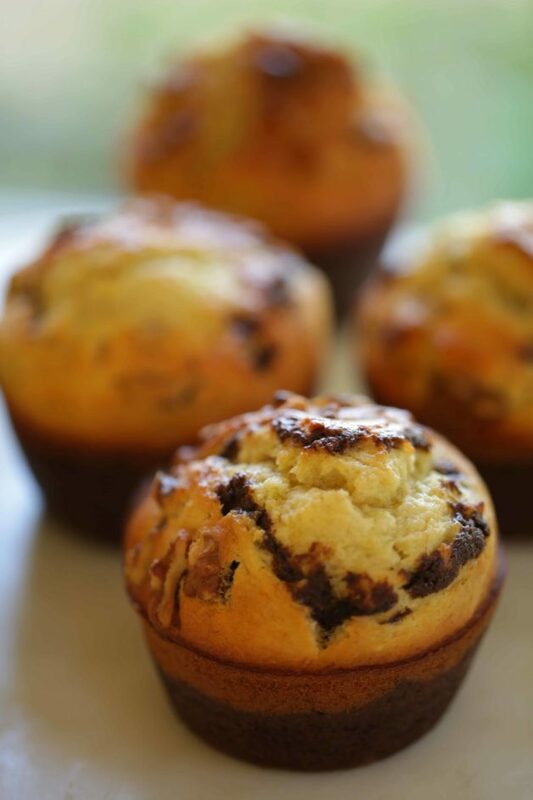 The moist banana bread on top, speckled with dark ribbons of chocolate is a little teaser for what is to come. For a step-by-step demo of this recipe watch my video below! When your guests slice them open they will be pleasantly surprised with a rich chocolate bottom! The pattern is a nice touch and makes for a pretty muffin when sliced. First make the chocolate batter. 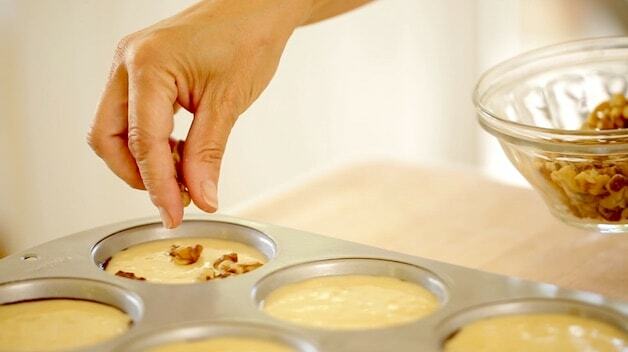 Then fill each muffin well with just one scoop of batter. If you use a standard size ice cream scooper, that’s a perfect amount. 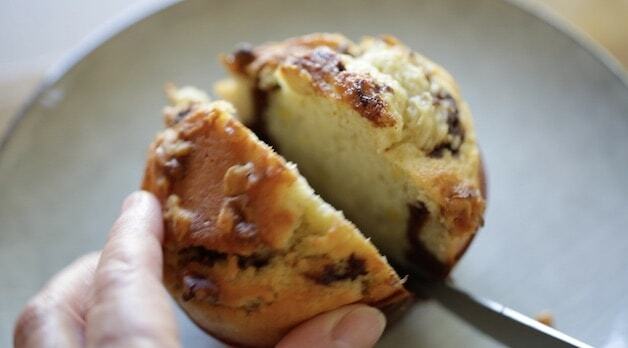 TIP: These muffins are prettier without muffin papers since you’ll see the exterior swirl. 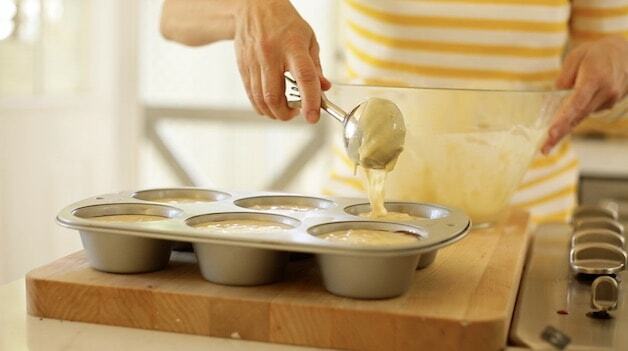 But spray your muffin cups well (even if it’s non-stick!) with baking spray. 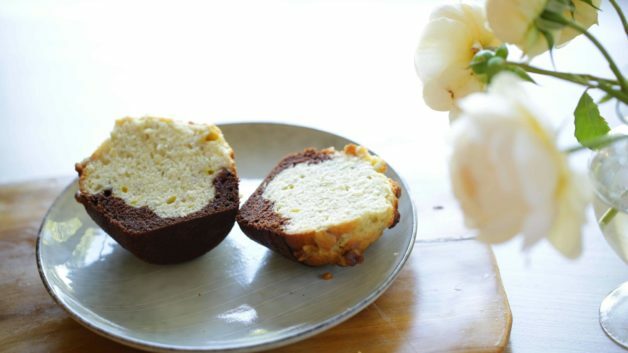 The secret to a flavorful banana muffin is a VERY ripe banana. 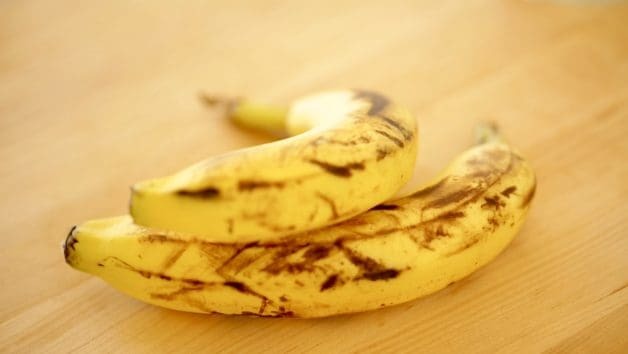 If your bananas are not very ripe they will not impart much banana flavor or sweetness. Bananas are also easier to mash when they are very ripe. 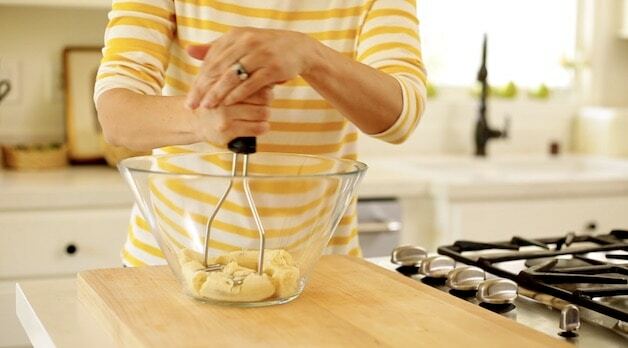 TIP: A potato masher is a handy tool for mashing bananas into a chunky puree. It works better than a fork. 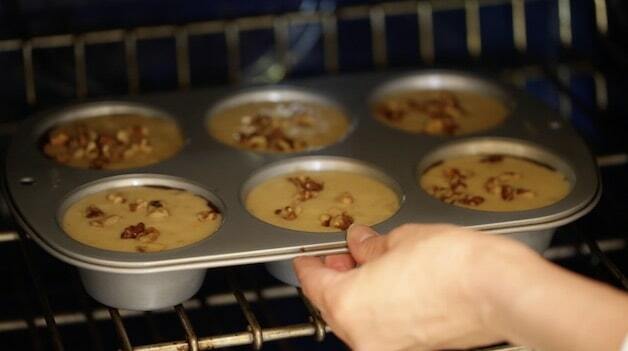 Then add them to your banana muffin batter, after adding the flour mixture. 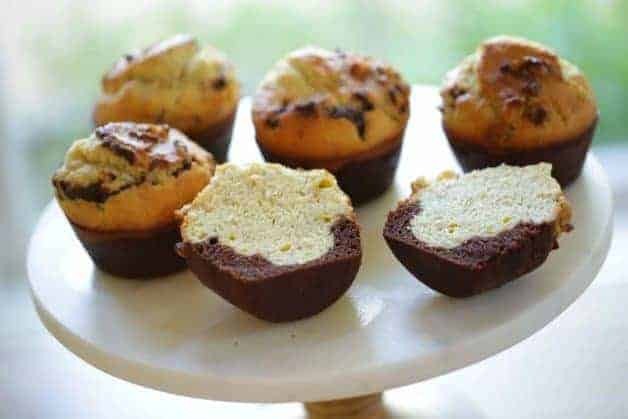 Fill each muffin well with the banana batter until it reaches almost to the top. This will create a nice domed effect once they are baked. I like to add walnuts on top for a bit of crunch, but you could omit them for any allergies. Bake at 400F (200C) for 15 minutes then reduce to 350F (175C) for 5 minutes. Allow to cool completely before serving. 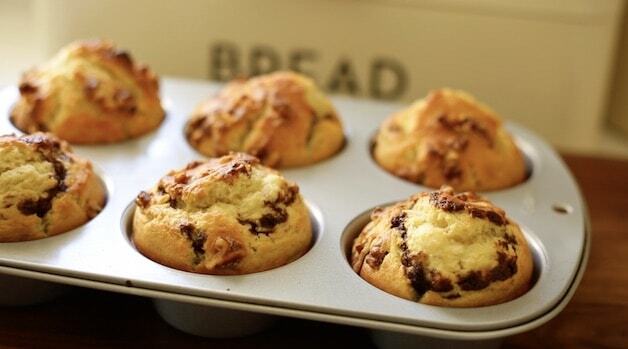 They will be easier to remove from the muffin tin that way. 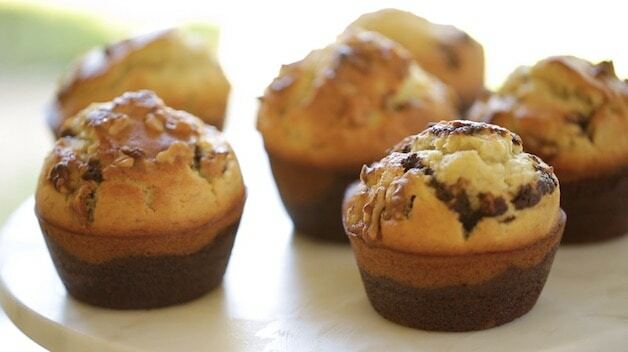 Spay a jumbo 6-cup muffin tip with baking spray and set aside. Mix together the chocolate batter first. In a large bowl whisk together the cocoa powder, water, and sugar. Then add the oil, egg and vanilla, whisking until smooth. Set aside. In a small bowl add the flour, salt and baking soda. Whisk until combined. Add the dry ingredients to the chocolate mixture, whisk until combined. 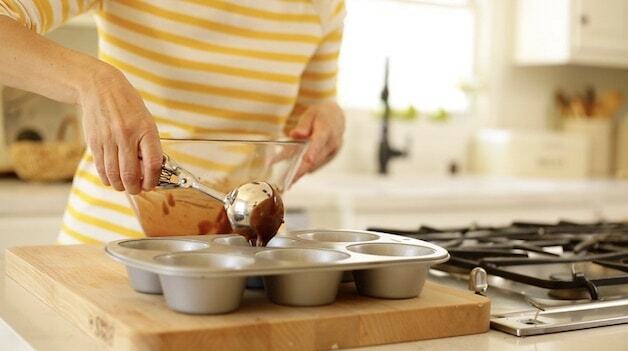 Using an ice cream scoop fill each well in the tin with 1 generous scoop and set aside. Then make the banana batter. In a large bowl mash the bananas with a fork or a potato masher. Add eggs, oil, water, sugar and vanilla, whisk until combined. 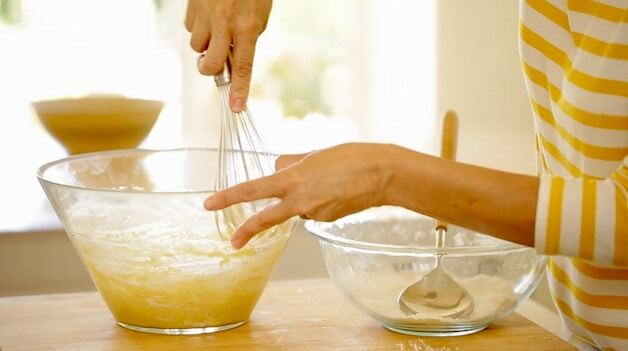 In a smaller bowl add flour, salt and baking powdered, whisk until combined. Add dry ingredients to wet ingredients until combined. Place chopped walnuts on top. 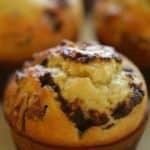 Bake muffins for 15 mins at 400F (200C) then reduce to 350F (176C) for 5 minutes. Allow to cool completely and then serve! I just made these and completely forgot the walnuts at the end. I also had to substitute 100 grams of sugar with brown sugar since I ran out halfway. They still turned out delicious! I love watching your videos because it’s so detailed and clear, quite fool proof for a baking beginner like me. I will try again another time, making sure I have all the ingredients set out. The only direction I didn’t follow from the written recipe was 15 minutes at 400C since in the video you suggested 12 – 13 minutes.